Solar technology is becoming more accessible every year. The cost of solar systems are decreasing, and the awareness towards how much homeowners can save going green is becoming more apparent. As a part of the process to find a reputable solar installer, homeowners may come across the question: “Do you have a solar-ready home?” It’s a valid question from solar companies, but it’s one that must be answered correctly for a solar system to be effectively designed and installed on any given residence. West Coast Solar will share with you the characteristics of a solar-ready home so you can get started on your solar system project. You want to start with how energy efficient your home is prior to installing a solar system. The goal is to see how you are using energy in your home and where you could make improvements. In some cases, a home can increase its energy efficiency between 5-30 percent by replacing appliances, attic insulation, and switching out light bulbs. You can also hire a professional to complete what’s called an energy audit. This process includes inspecting various energy use aspects of your home like searching for air-draft leaks around doors and windows, insulation flaws, inefficient light bulbs, malfunctioning water heater or furnace, and more. Finally, you can consider “electrifying” your home by switching to electric appliances and heat. The switch will offer a single bill for your energy use and remove other energy sources from your home, saving you more money over the long term. Three aspects need to be considered to determine whether or not your roof is solar ready. The first is the roof age. How old is your roof? When’s the last time it was inspected for damage? If your roof is in need of a replacement or will need a replacement within the next five to 10 years, it’s a good idea to replace the roof prior to installing a solar system. The second consideration is the roof material. The solar installation process may be easier or harder depending on the type of material on your roof. This is a factor when trying to hire an installer. Some won’t install on certain roof materials like cedar shingles or slate. 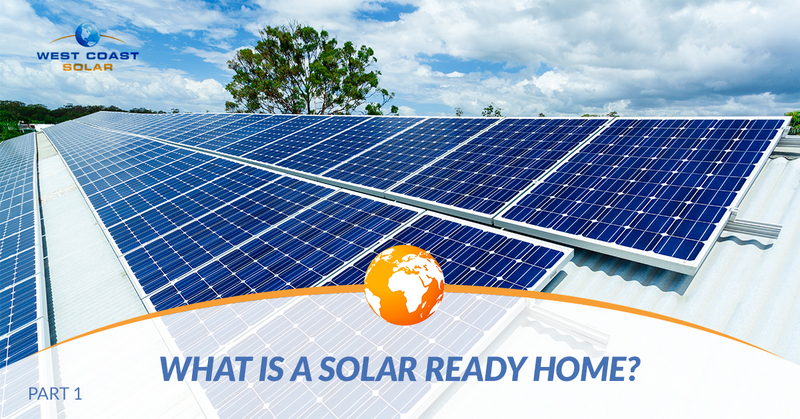 Both materials are fragile, which can cause complications while installing the solar system. It doesn’t mean you should fret. West Coast Solar installs solar systems across many types of roofing materials. Give us a call today, and we can discuss your solar questions and concerns. Additionally, if you’re in the process of building a new home and want it to be solar ready, avoid fragile or “complicated” roof materials. The third and final consideration is the roof structure and space. Installing a solar system involves panels, hardware, and various other components that take up a lot of roof space. This means, depending on your energy production goals and consumption needs, your roof area will determine the size of the system you can have installed. Again, if you’re building a new home, and you want it to be solar ready, make sure and have a conversation with your designer and builders to ensure you can install a solar system large enough to fit your expected energy needs. Call West Coast Solar Today! Do you have questions about your home being solar ready? West Coast solar is ready to answer your questions and offer suggestions on how to best approach purchasing, designing, and installing a solar system on your home or property. You can learn more about how to tell if your home is solar ready in part two of this blog series. If you’re ready to discuss a solar system for your home, give us a call today!